Photo courtesy of AJC ajcann.wordpress.com. If you’ve spent some time on my blog, then you know how much I love viruses. These tiny (well most of them!) pathogens use a miniscule amount of genetic material to produce millions of copies of themselves while evading destruction by their hosts. And they do it extremely efficiently. 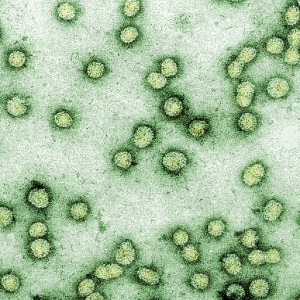 Besides providing multitudes of graduate students with material for doctoral studies, and wreaking world-wide havoc, viruses actually have enormous medical potential. Scientists have been trying for decades to harness the power of viruses and direct it towards their own targets, such as cancer cells. A new study at Duke University suggests that they may have been successful. While most people in the world have been trying to eradicate polio, Dr. Matthias Gromeier believes in the power of polio to treat cancer. To infect a cell, a virus must first gain entry into the inside of the cell. It does so by binding to a cellular protein called a receptor. Viruses from different families use different receptors to unlock the cell. Coincidentally, most solid tumors abnormally express the receptor for polio. Thus polio virus can act like a smart bomb that targets cancer cells but leaves normal cells alone. Wild polio virus causes a highly infectious disease that can result in paralysis and death. In fact, scientists had hoped to eradicate polio from the globe and now only a few areas in the world suffer from polio infections. How then could scientists think that polio could be used to cure cancer? In fact, many scientists thought it was a crazy idea, but Dr. Gromeier’s research group engineered the polio virus to make it safer. They removed a portion of the virus genome responsible for causing disease in mammals and replaced it with a part of an ordinary cold virus. This replacement resulted in the PVS-RIPO virus: a virus that can enter and kill tumor cells by growing in them, but can’t cause nerve cell injury nor paralysis. The virus also cannot change back into a wild type virus (called reversion). In 2012, PVS-RIPO began Phase I clinical trials in patients with glioblastoma, an extremely aggressive brain tumor that can double in size in 2-3 weeks. Phase I trials are designed to find the highest effective dose that causes the least amount of complications or side effects. At this stage it is not necessarily expected that the treatment will work. As the first patient began treatment, the idea of putting polio virus into the brain was still crazy. And at first the results were disappointing. MRI scans showed that the tumor was increasing in size and it appeared the virus wasn’t working. But later scans showed something quite astonishing. Instead of just killing cancer cells on its own, the virus had stimulated the patient’s immune system which was also fighting off the cancer. The doctors weren’t seeing a tumor that was growing, they were seeing an increase in inflammation in the brain as a massive battle was underway. 21 months later, the tumor was gone. The second patient showed the same remarkable results. But as the trial continued, there wasn’t always success. Higher doses of the virus caused excessive inflammation in the brain. This caused one patient to leave the trial after the pressure in her brain from the inflammation caused partial paralysis. Despite inflammation in the brain, PVS-RIPO has shown remarkable success. Tumors in patients treated with PVS-RIPO shrink and disappear as the virus and the patient’s own cancer-fighting cells work together to destroy the malignant cells. As 60 Minutes reported just this month, 22 people have been enrolled in the study. Eleven of the patients enrolled in the trial have died; but they lived longer than expected if they had not undergone treatment. The other 11 patients are continuing to improve and 4 of them have been cancer free for 6 months or greater. PVS-RIPO is effective against multiple cancers, including lung, breast, colorectal, prostate, pancreatic, liver, and renal cancers in the lab. It is hoped that the virus will have the same effect in vivo.